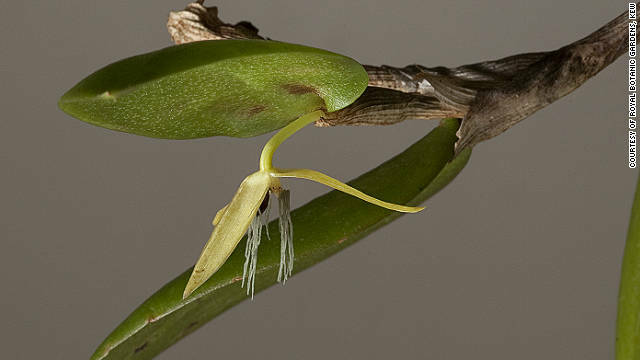 The Night-blooming Orchid (Bulbophyllus nocturnum) was chosen as one of the International Institute for Species Exploration Top Ten New Species 2012, one year ago this week. Bulbophyllus nocturnum, I thank you. Not for being the only known orchid species to blossom only at night, even though being so unique among the other 25,000 orchid species indeed makes you noteworthy. Not for being discovered on the remote island of New Britain off the coast of Papua New Guinea by researchers studying a potential logging site. There are plenty of singular species already lost to science through logging, so in that respect, you are nothing special. Not for being so newly discovered that you don’t even have a common name yet, leaving open all manner of suggestions. Queen of the Night is already taken by a stunning cactus flower and – don’t take this wrong way – you don’t really live up to the title. Frankly, you look like a limp spider poorly drawn by Salvador Dali. Pale, droopy petals and dangling appendages that supposedly imitate a local slime mould, favorite food of a kind of midge. I’m sure you have a winning personality, but your looks won’t dazzle the average flower enthusiast in search of a new exotic for the garden. You don’t have the flair of the bat-pollinated Midnight Horror Tree, also known as the Broken Bones Plant – your flowers aren’t large and ghostly, you have no sword-like pods that break off to look like a pile of broken bones. Neither dangerously pretty nor predatorily fragrant, modest B. nocturnum, your claim to fame is that you bloom only at night, and for one night only, and you are the only known orchid to have learnt that trick. Like a washed-up singer persuaded to do that one last show, you come alive in one place, under cover of night, and around dawn you go to pieces, never again to glory in the light of the moon or bask in the attention of your nondescript, nightcrawly admirers. Even vampires get to return for a repeat peformance. And it is for this I thank you. Even as the search begins for a suitable name, we can already start using you as a sublime metaphor. Of course, the first thing that comes to mind is the short-term romance, begun after dark in the corner of bar and finished at dawn without so much as a backward glance or a proper exchange of names. A B. nocturnum fling –a bit ugly, losing the last smidgen of its already meagre appeal by the light of day. The Last Call orchid of the tropics. Your potential for poetic duty doesn’t end there. You, my darling epiphyte, may serve as the descriptor for unattractive deeds, carried out under cover of night or deepest obfuscation, meant to attract the same swarms that would otherwise feed on slime mould, acts of brutal brevity that nonetheless perpetuate the parties involved. Perhaps we can stretch the notion of a single night to indicate the very brief duration of something from when it is conceived in darkness and falls apart by light of day or public examination. The Sub-Prime posy. The Bank Bailout floret. We could instead focus our attention your fragile, unsightly, yet useful form. Like an interim military government following a popular uprising, no one thinks you’re the belle of the ball, but they still all want to dance with you. At least for now, before you start falling apart, and before anyone else finds out who, exactly, has been deigning to be your dance partner. The pale Orchid of Egypt, perhaps. I’d use you as a metaphor for the logging industry that will be your probable demise, for that industry is useful and ugly at the same time, but it has operates round the clock and not just at night – and will likely do so until we run out of trees. For the moment, my new friend, I will just congratulate you for what you are: A survivor, a plain wee vessel that has carved out its own discreet niche in the big, big world, not bothering anyone, and recently elevated to international stardom just for being yourself, the otherwise unassuming Night Blossoming orchid.